Osram-GEC was relatively late to enter the market for general lighting metal halide lamps, principally owing to the fact that it appeared to have had difficulty in making lamps having a high quality white light output that was stable throughout lamp life. 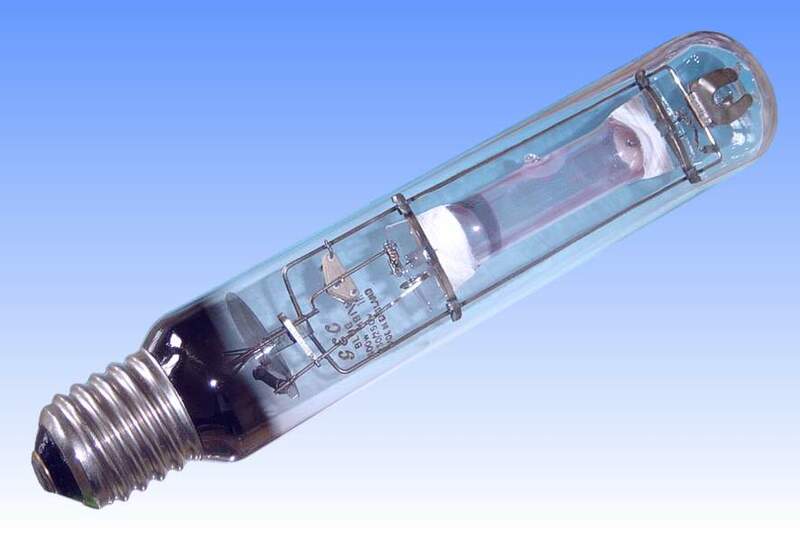 GEC metal halide lamps were based on tri-band technology, consisting essentially of a normal 400W mercury arc tube dosed with the halides of sodium (peach colour), thallium (green) and indium (blue). By adding these constituents in the appropriate quantities it was possible to balance their respective radiations to yield a white light output. 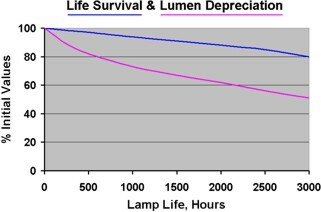 However the sodium iodide was lost relatively quickly in the early GEC lamps as a result of electrolysis effects and reactions with other arc tube materials which saw it gradually being consumed. 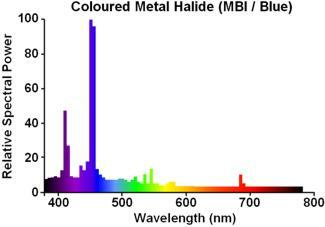 Consequently the colour would shift either towards blue or green as the relative intensity of the remaining indium or thallium dose took over the discharge. Since it proved so difficult to make a stable white lamp, but very easy to make one whose colour ended up strongly coloured blue or green, it was decided to try marketing these lamps in coloured versions, with some success. They proved popular for the floodlighting of trees in parks and gardens in inner-city areas, or to produce spectacular effects in the night lighting of prestigious buildings. Both the blue and green 400W lamps incorporate a snap-starter allowing the lamps to be operated from a normal mercury lamp ballast. However the use of an electronic 'stabiliser' was recommended to control the shape of the current waveform and prevent both flicker, and overloading of the electrodes which would lead to premature blackening.